Many things characterize the summer season: like visiting the ocean, BBQ, and fireworks. But summer festivals are an essential part of summer in Japan. When people think of Japanese festivals, they usually think of wearing yukata and of food stalls selling shaved ice, fried noodles, fried octopus balls, grilled chicken skewers, and cotton candy. Some think these stalls are the main point of festivals, but this is only part of it. There are many festivals all over Japan. Once upon a time, people in rural areas were afraid of calamities such as famine, plague, and natural disasters. So it is said that festivals began as ritual performances to appease evil spirits and pray to gods. 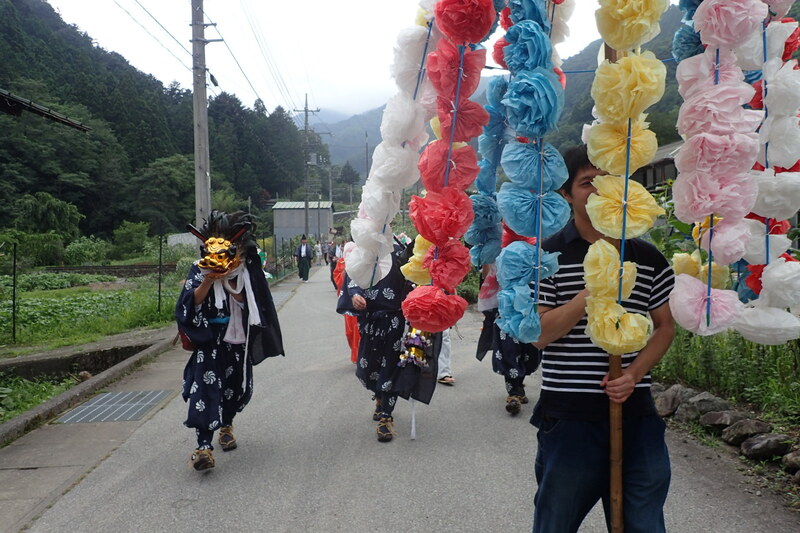 Besides Genryu Matsuri in May, Kosuge Village has several smaller, traditional festivals connected to local shrines. 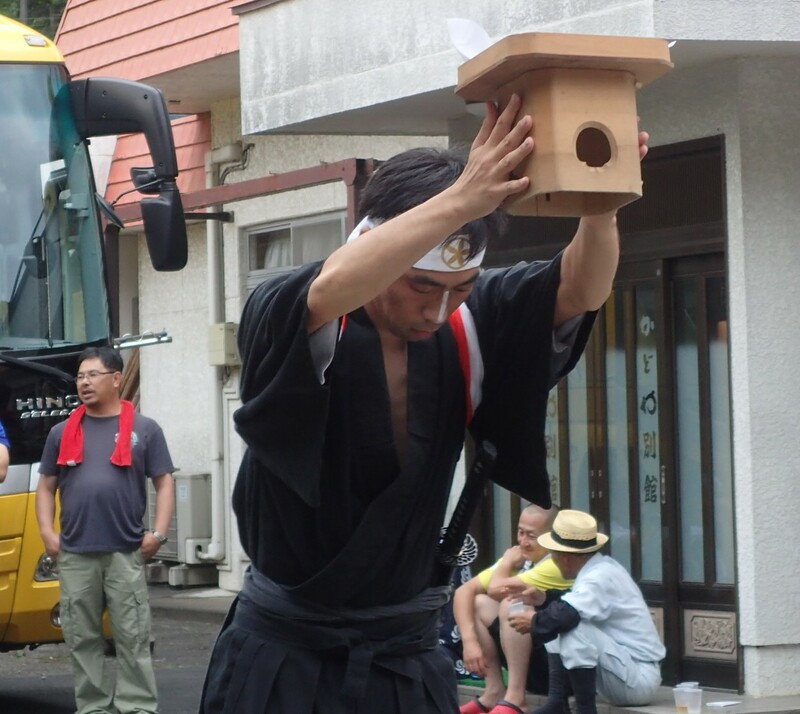 These local festivals have a different spirit than many of the more lively mikoshi (portable shrine) parades had in cities or larger areas. 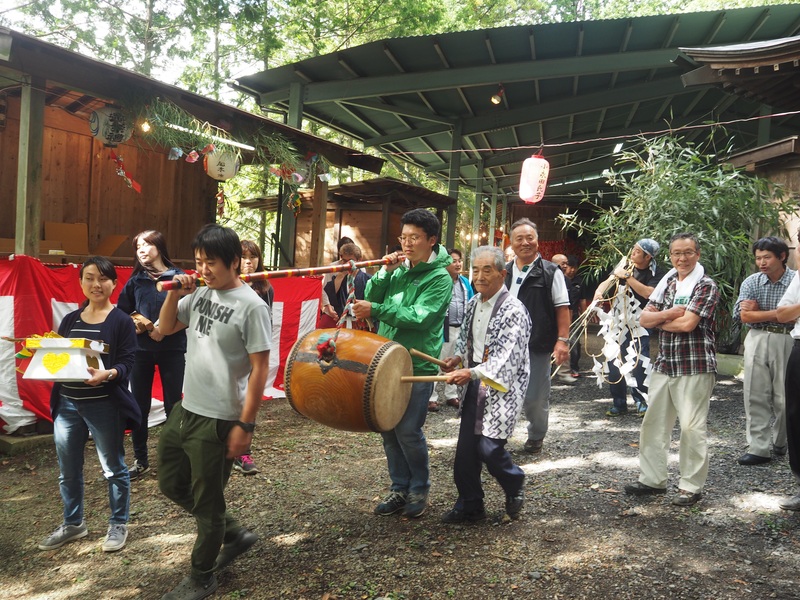 Sangamura means ‘three village festival’ because it is a combined festival of three districts which long ago were three different villages: Kawakubo, Ikenoshiri and Tamoto. Kosuge Village has 740 people. The districts of Sangamura comprise 230. For this festival, locals do a lion dance (shishimai) in the afternoon, and perform skits at night. When people hear ‘lion dance’ they may think of parading around lion floats for the Chinese New Year, but the lion dance of Sangamura is a totally different thing. 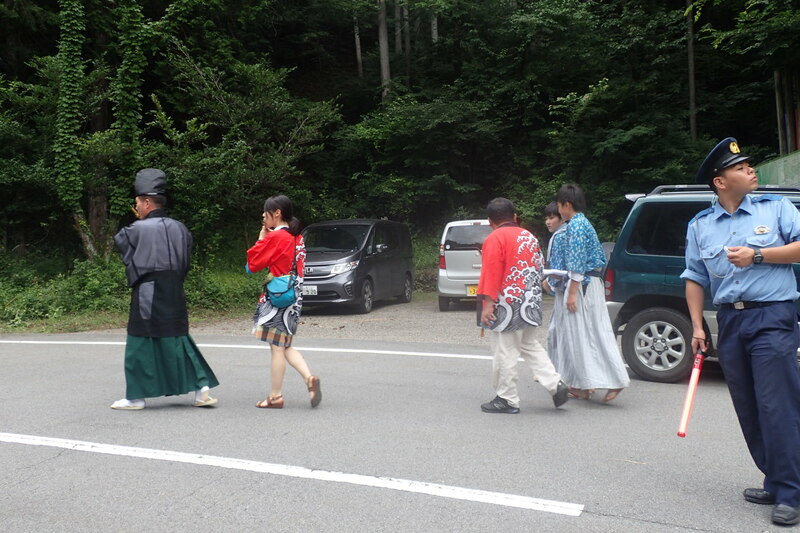 It is said to have come to Kai Province (present day Yamanashi prefecture) from Ise Grand Shrine. Currently, the Sangamura lion dance consists of twelve separate dances performed at seven different location across the three districts. 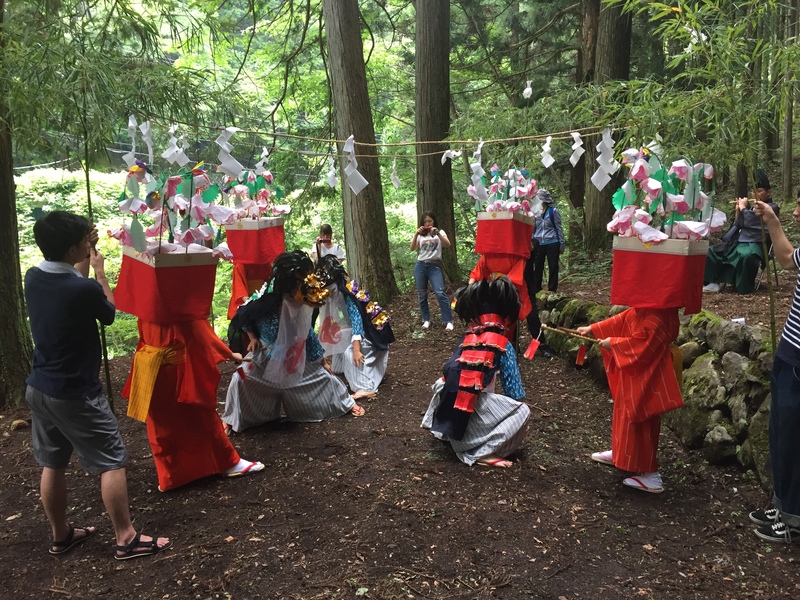 Three lions dance between four girls wearing red kimono and cube-shaped veils around their heads (representing flower pots) playing sasara (a kind of percussion instrument rubbing a bamboo whisk over a notched bamboo stick, similar to a güiro). The dancers are accompanied by three flutes, a taiko drum set, and one singer. It begins under the pavilion next to Yagyu Shrine. 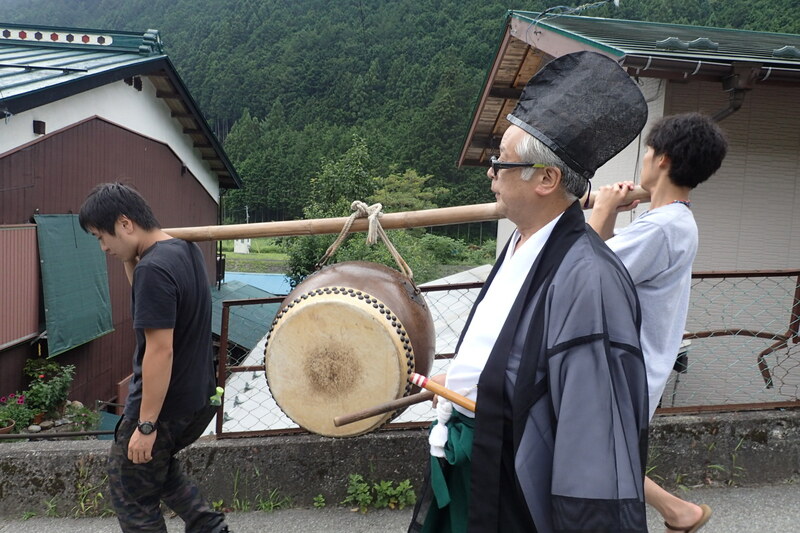 the taiko drum carried on a bamboo pole. The dancers and villagers follow behind. 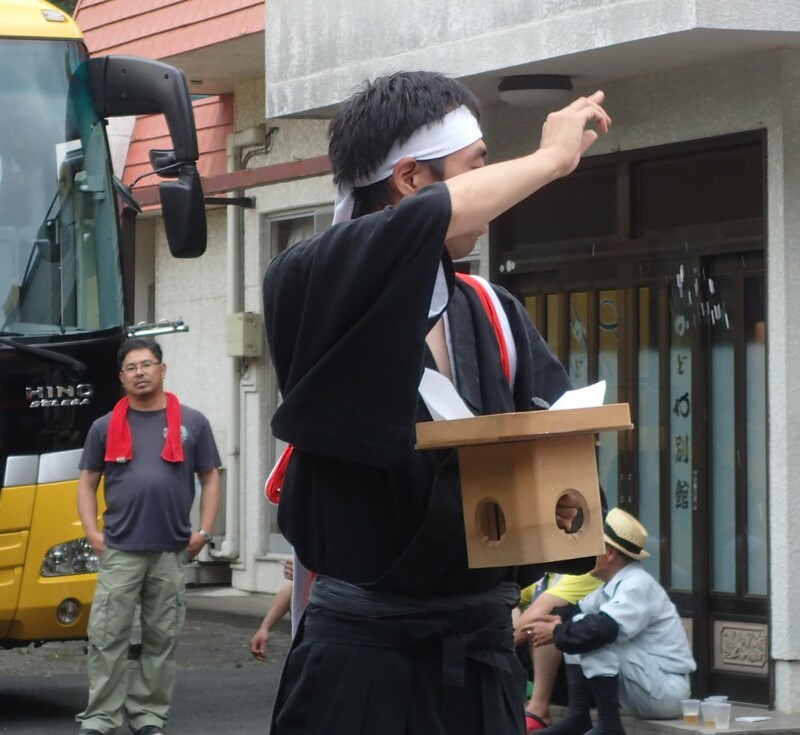 Kosuge’s policeman assists to guide traffic around the procession. 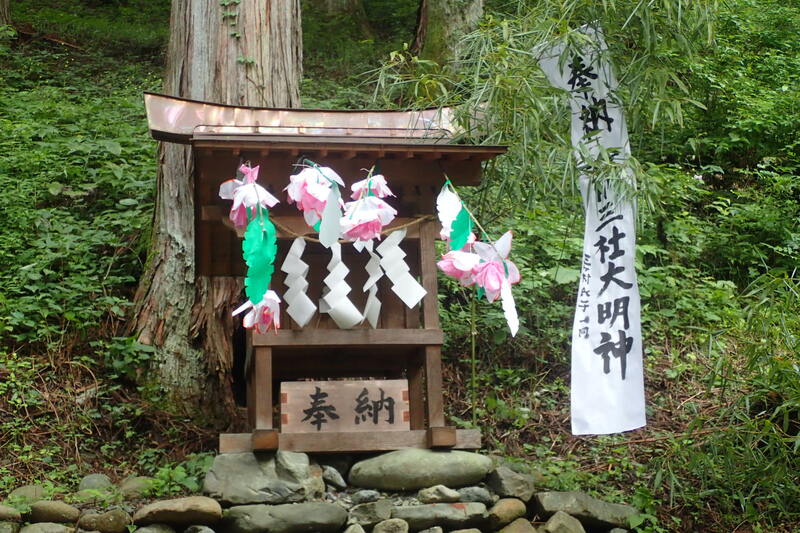 and finally at a mini-shrine on a hairpin bend in the road on the edge of Tamoto and Nakagumi area. 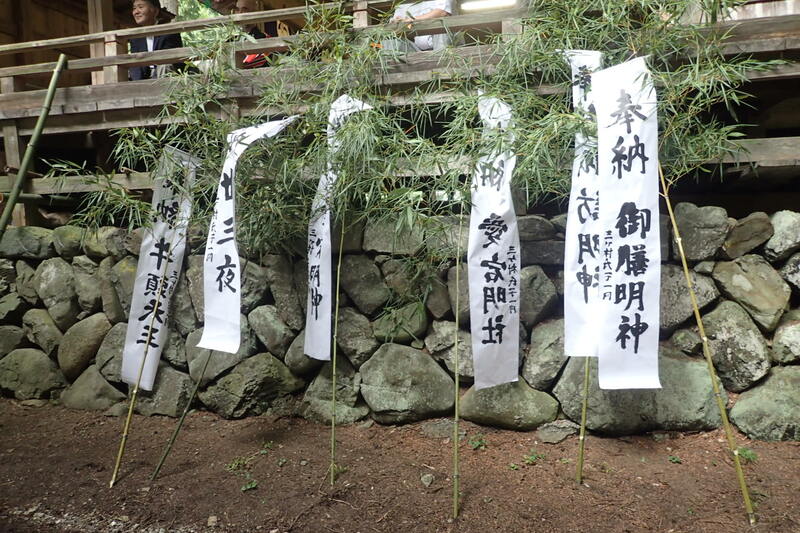 The name of each shrine’s god inscribed on a banner attached to a bamboo leaf is left at each m. This signifies that the shrine has been tributed. The entire dance and procession lasts about 4 hours. 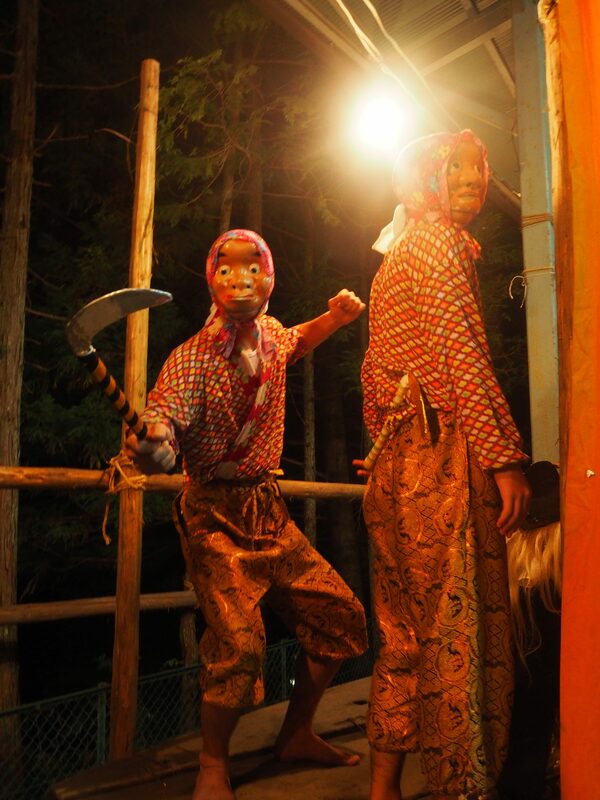 In the evening, the same villagers stage a variety show including guest enka singers, skits, and bingo. All performers are local villagers, and they have carried this tradition generation to generation. 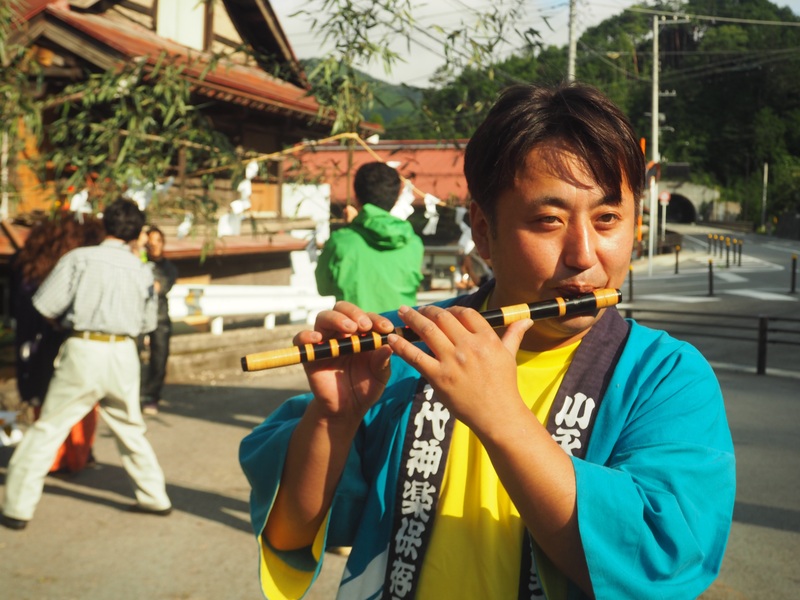 But regardless of whether you were born and raised in the village or emigrated, anyone who lives in the districts of Sangamura can participate in the festival as a performer. Of course, participation in the exercises and preparations held late into the night for several weeks beforehand is essential. The dance is physically demanding. Sometimes your legs will hurt in practice. But, everyone still participates. So why do villagers go through so much work every summer? There is sense of achievement and completion when the movements of the lions sync up after weeks of being disjointed. Another thing is that people who do not usually meet are gathered and taste a sense of unity from working hard together for a common purpose. These feelings of comfort and unity are similar to a school “cultural festival.” Everyone working hard toward one thing bonds people together. So you can feel the roots of Kosuge Village unity here. 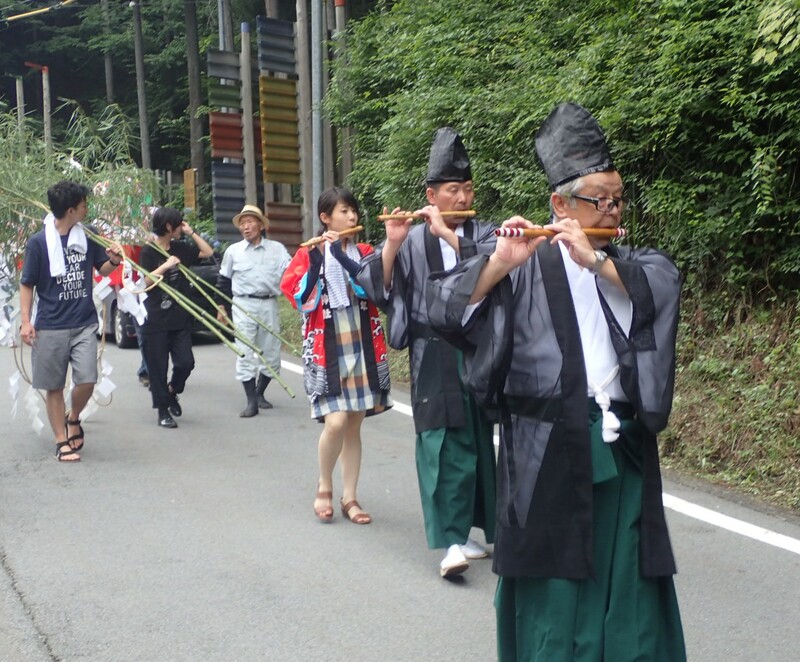 Sangamura Festival is held on the first Saturday of August. 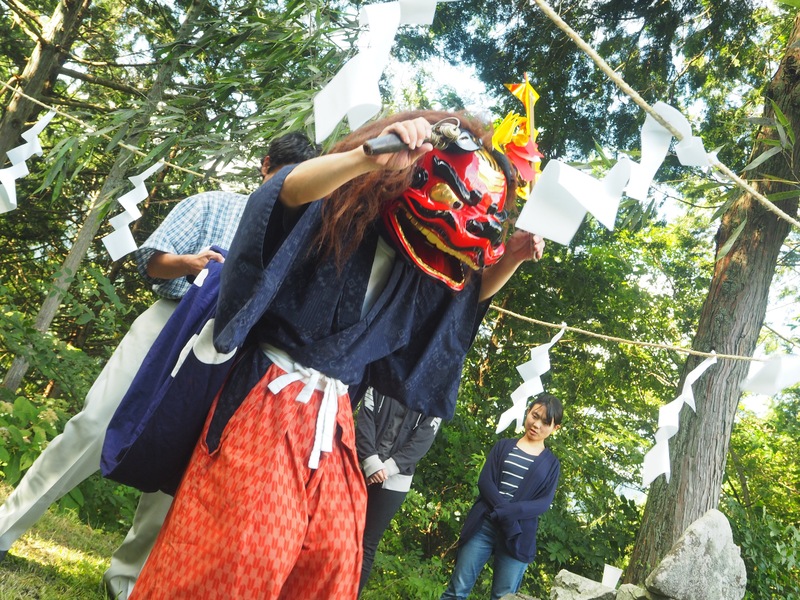 Hashidate District’s shrine festival venerates Hachiman, the god of war. 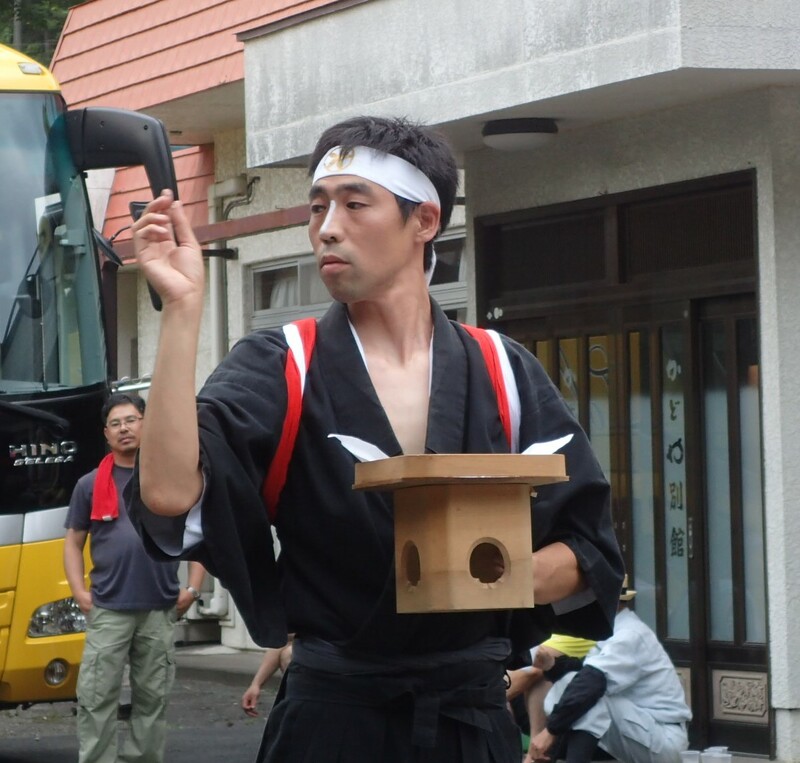 This festival has a different style from Sangamura. 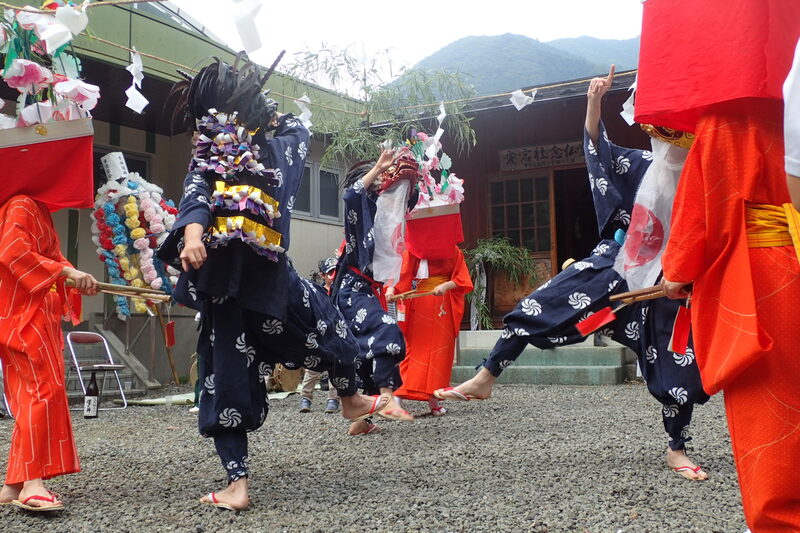 Instead of lion dance, the performance is a kind of kagura, ancient Shinto theatrical dance. This style of Kagura is more than 250 years old. Instead of parading around, it is all performed on a stage. The movements are slower and dramatic, closer resembling a play with a more complicated story. The local children also perform dances during the intermissions. 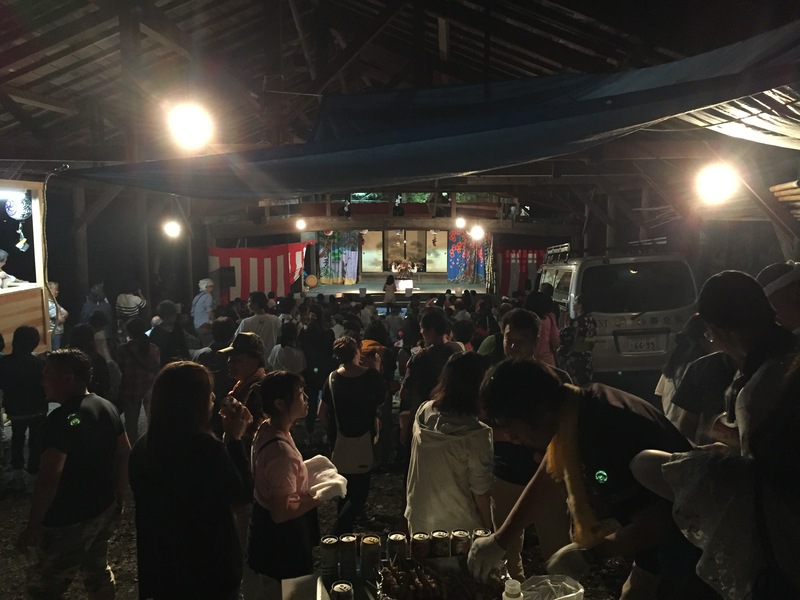 The Young Men’s Association sells yakitori and drinks from the back. 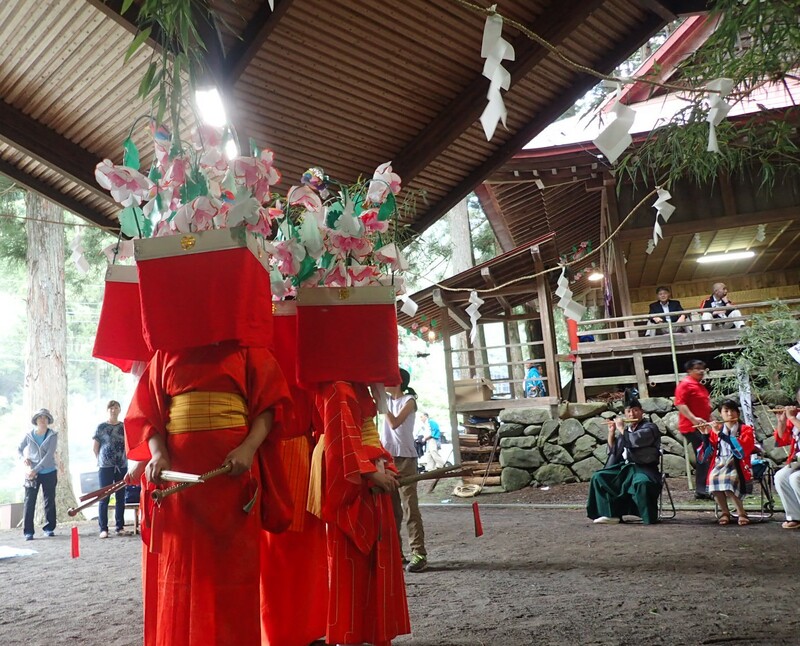 Hachiman Shrine Festival is held on the second Saturday of August. 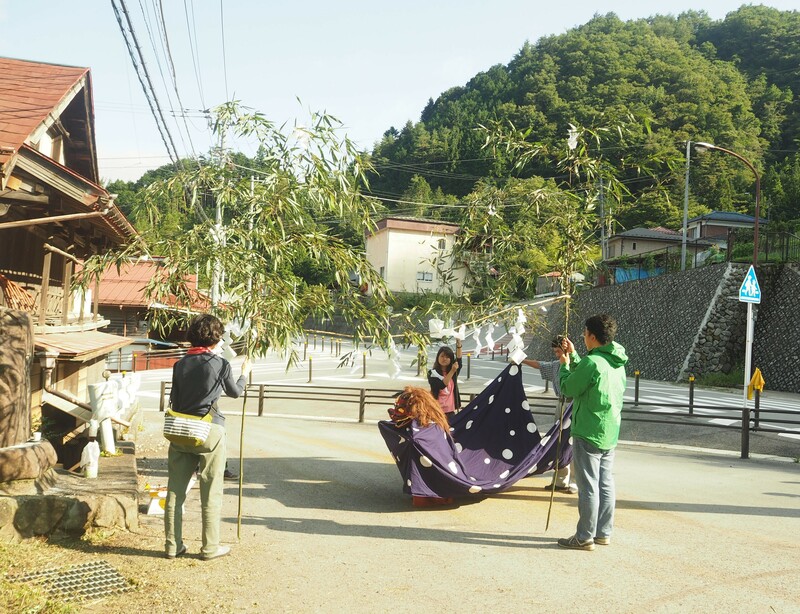 Like Sangamura, in the afternoon residents of Konnagata District ceremonially distribute bamboo banners and pay tribute to the area’s mini-shrines. 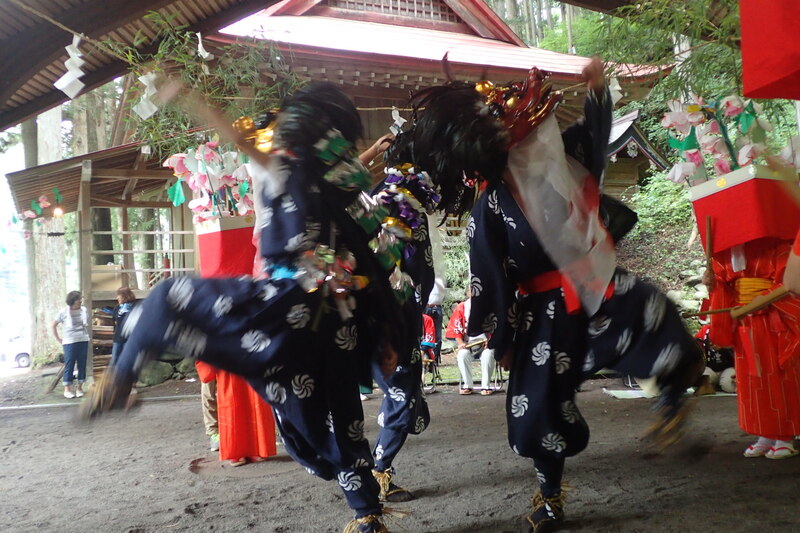 But the main event of Kumano Shrine Festival is a kagura performance like Hachiman Shrine Festival in the evening. 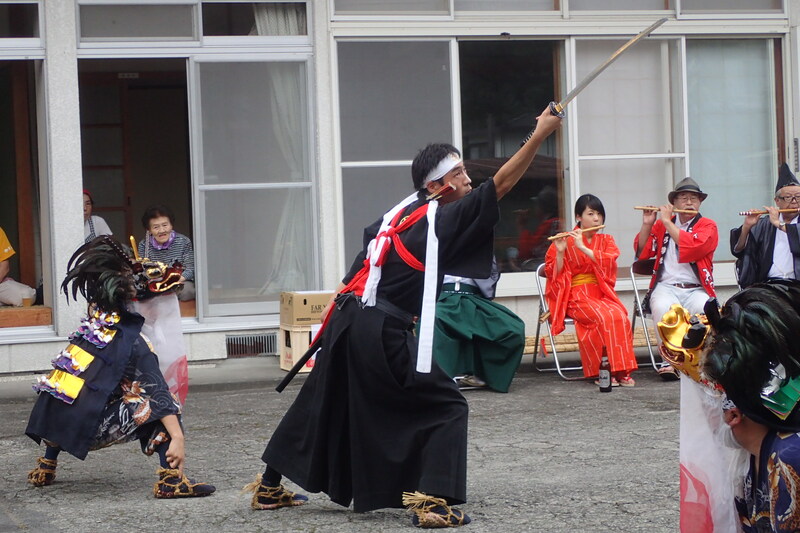 The ‘Konnagata Kamiyoshi Kagura’ is designated as an intangible cultural folk property of Kosuge Village. Actually, every year only a small section is performed. The entire cycle is about 24 hours long! 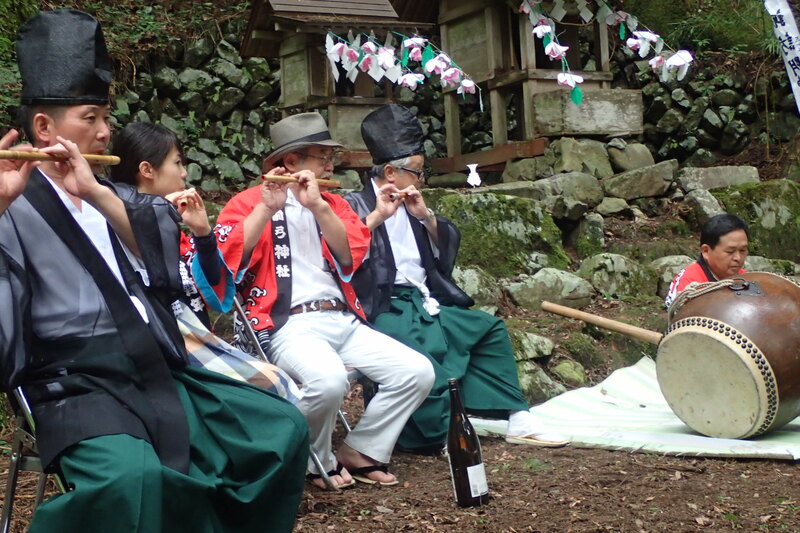 Kumano Shrine Festival is on the first Saturday in September. 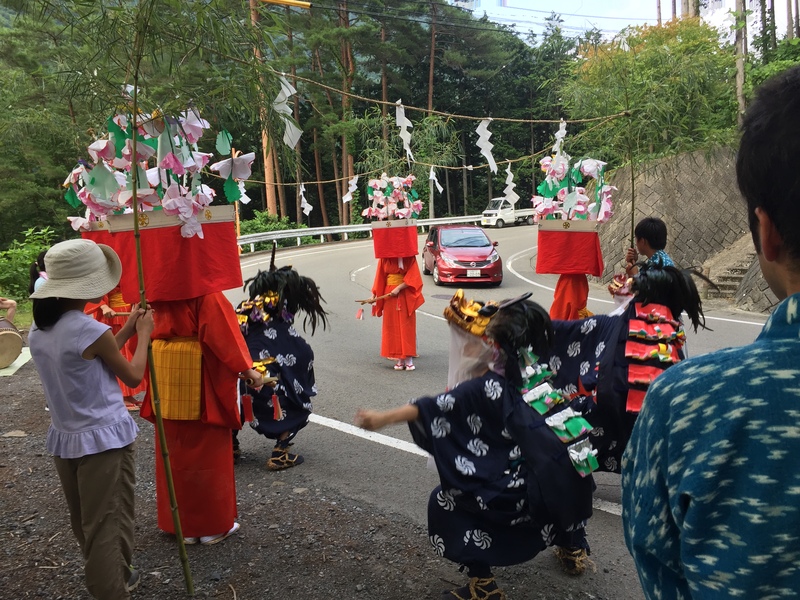 Obon is a summer holiday celebrated all over Japan. 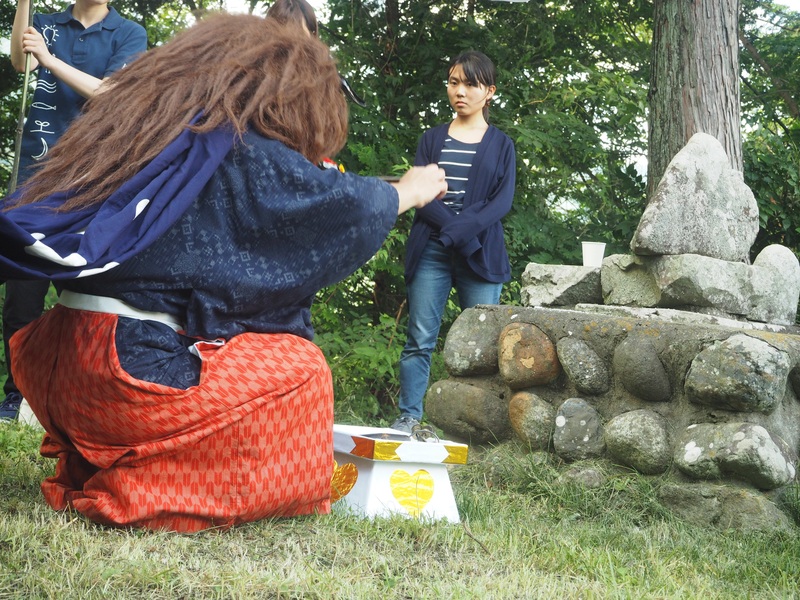 It is a time when people return to their hometowns to visit their ancestors’ graves and be with their families as the spirits of the ancestors return to their household alters. As a time to remember the dead, it is similar to Day of the Dead or Allhallowtide (it also lasts for three days). 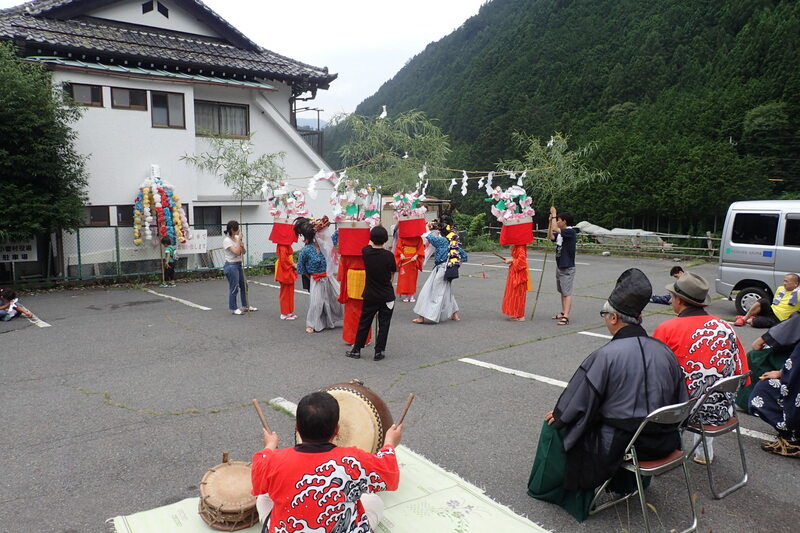 In most of Japan Obon is celebrated in mid-August, but in Kosuge it is celebrated a month earlier in mid-July. 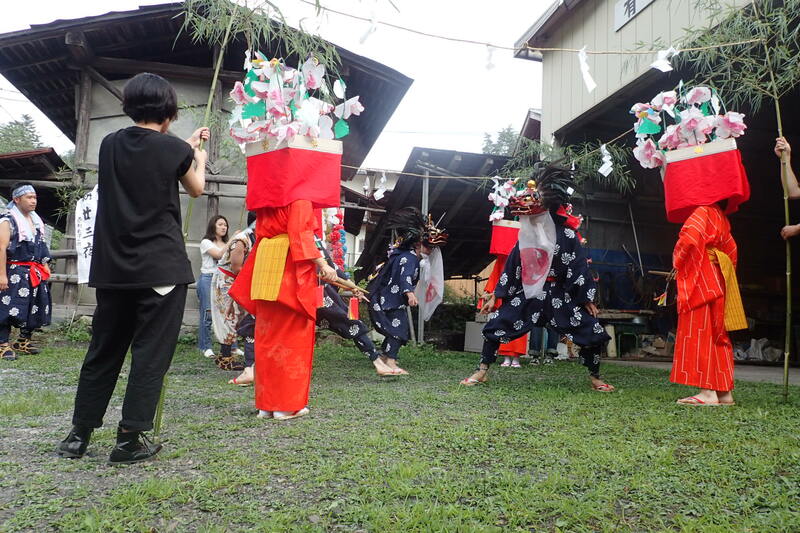 The key public event of Obon is bon odori (bon dance). 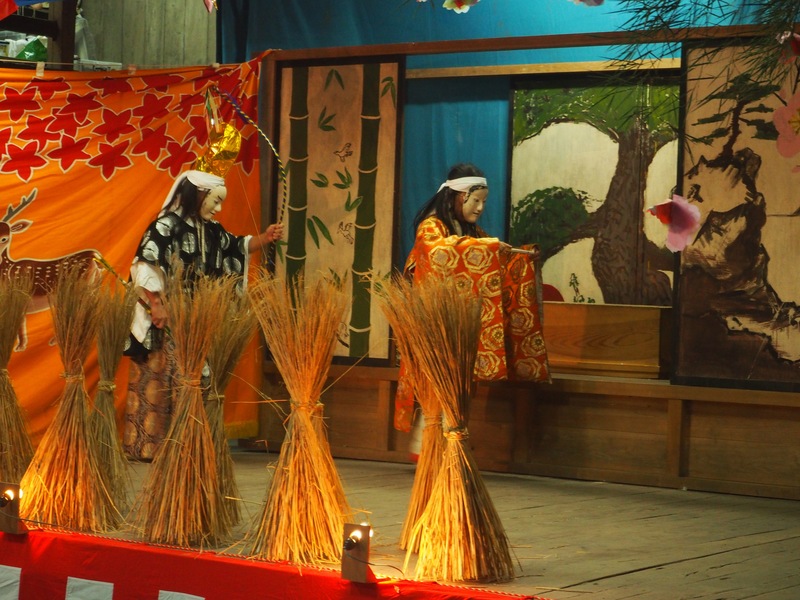 In the evening, communities dance in yukata in a circle around a taiko drum platform lit with paper lantern streamers. 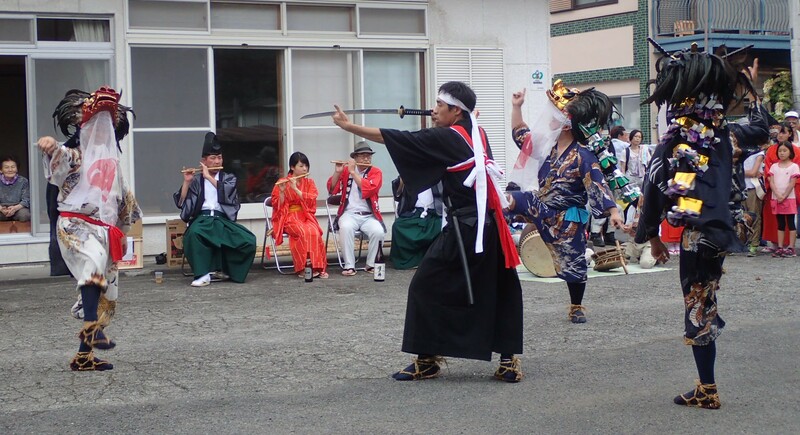 In Kosuge, bon odori happens in front of the hot spring in conjunction with a beer garden. It is a good time to enjoy folk music and visiting with locals.